Anyway, comment and improvement suggestions really welcome. OH! But you if you download it, it still works! Thanks crewcifix for telling me that! The character and the background fit so well and I love the pose of the character, so cute ^^ . +fav from me :) . the wallpaper is very beautiful and it also has a good scenary. Cloudnine this is a beautiful wallpaper! good 2 c sumfin different! keep it up! Another pretty wallpaper ...the only thing that I would change would probably have more variation in colour in the grass - it will make it look kinda more realistic. Other than that, nice! Awww it ish sooo cute XD I love totally the Colors! They're soo bright and lovely! 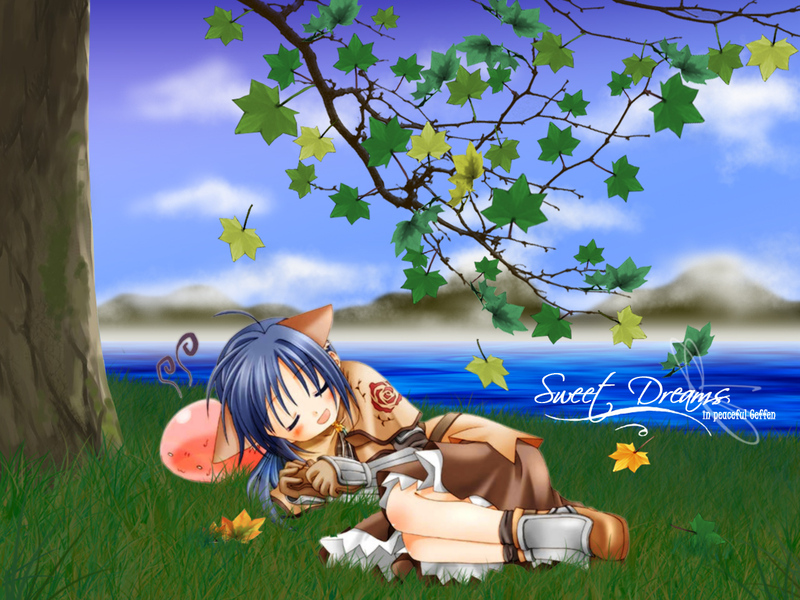 The BG is very pretty I like a lot the tree, the leaves are very well made :D The water ish also Gr8! BTW: do you have bigger resolutions? Like: 1280x960 please? and the leaves are so realistic !!!! real good pics, the bg is ok but the leaves dun look real enough. Very, very, very cute, really beautiful Swordie.